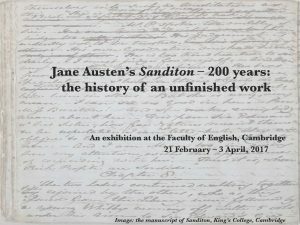 The Cambridge English Faculty has currently on display material tracing the public life and textual forms of Sanditon, Jane Austen’s unfinished novel, which she composed in the year of her death, 1817. The manuscript of Sanditon is held in King’s College, Cambridge, where Jane Austen’s great-nephew was Provost. This exhibition traces the public life and developing textual forms of Sanditon, from the first public reference to the work in James Edward Austen’s-Leigh’s 1871 Memoir of his aunt, through to the first published edition of Austen’s fragment (1925), the first facsimile edition (1975) and other continued, illustrated and translated editions, up to digital text. The items on display in this exhibition are on loan from Cambridge University Library and from the Gilson collection at King’s College, Cambridge.